Employment Update: I have held off on including these updates for a couple posts, because I have had several things still up in the air, but I can now announce that I am back at Churchill Downs and will be working on the Events Team until the end of June. I am really excited because I will be working on the Taste of Derby, the Kentucky Oaks and the Kentucky Derby. This will definitely be an awesome experience and I am very happy to have the opportunity. To cook the venison, warm the loin in butter (no higher than 140 degrees) and then sear the loin on all sides. The parsnips should be cooked with a couple tablespoons of milk and cream. For the puree, the core of the parsnips should not be used. The beets should be roasted. The mushrooms should be poached in butter and then finished with thyme and olive oil. The red cabbage should be slow braised with some vinegar and lemon juice. 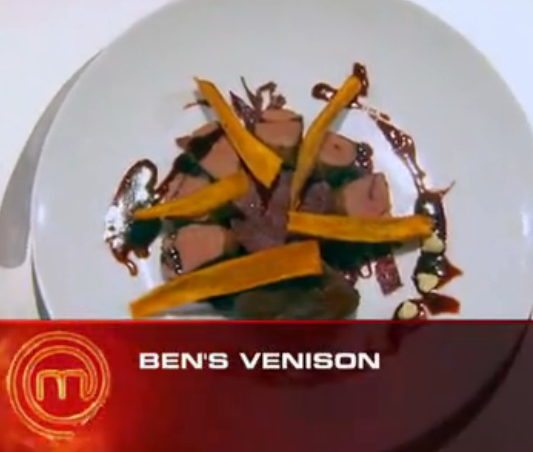 Even though Ben had several advantages over his competitors, he made too many mistakes and was sent home. 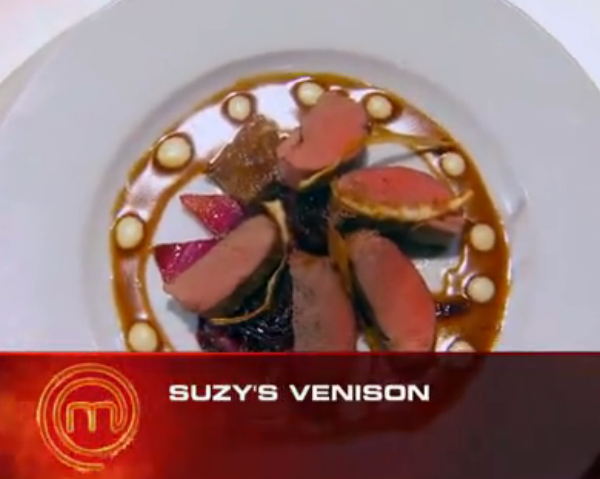 Suzy (who had the judges’ favorite recreation), Christian, Adrien and Jennifer moved on to the top four. This was a difficult challenge because there were so many different components that required techniques that I had never really attempted before. There was also a lot of equipment and different types of ingredients that I did not really have access to. I did my best to recreate the dish but it was definitely the hardest dish I’ve ever done on this blog. For ease of explanation, I’m going to take this one component at a time. I knew that I was not going to be able to get any venison loin at the grocery store, so I decided to do the same technique that Gordon described to grass-fed beef top sirloin. I decided to warm the steak in clarified butter with smashed garlic cloves and shallot slices. I put the burner on low, covered the pan and moved on to other components. Everything that I read and saw on the episode said that this process would take an hour or more. But when I checked it after 20 minutes, it was already completely brown. I did not have a thermometer so I don’t know how hot the butter got, but it was obviously much too high. Just before serving, I seared the beef on both sides for a less than 2 minutes a side. But when I cut into it, it was almost completely brown in the center. There was some pink still left but it was clearly overcooked. And the meat was really tough as a result. For this component, I melted enough butter to cover a portobello mushroom cap. Then, I allowed the mushroom cap to bathe in the butter on low heat until the mushroom was tender (about 15-20 minutes). Just before serving, I seasoned the mushroom cap with salt, pepper and fresh thyme and then pan seared it in some olive oil about a minute per side. Finally, I trimmed the cap into a square for plating. For this component, I simply followed a recipe that seemed the closest to what Gordon described. The recipe that I used was Tyler Florence’s version: Parsnip Puree. The only issue I had with this was that I did not have a food processor or a blender so I had to hand mash the parsnips. The flavor was great but the texture was not as smooth as I would have wanted. Overall though, it was a great and tasty component. This is another component in which I used a recipe as a guide. I used Alton Brown’s recipe for this: Parsnip Crisps Recipe. In terms of presentation, the one thing not shown in this recipe that needed to be done for the dish was to make the parsnip strips in a spiral shape. To get this effect, I just twirled the parsnip strips around my finger before putting it into the oil. This sort of worked but I’m sure there is a much better way to get this to work and look uniform. I also fried the crisps in crisco instead of peanut oil, and it worked great. I’m sure any oil would work fine. The crisps turned out perfectly. They were actually my favorite component of the whole dish, oddly enough. I will probably just make these again to keep around as a snack. Definitely the easiest component of them all, I simply sliced the beets, tossed them in some olive oil, salt and pepper, and put them into a 400 degree oven for around 30 minutes (until they were fork tender). As always, roasted beets are simple and delicious and one of my favorite things to make. I used this recipe as a guide for this component: Braised Red Cabbage with Vinegar. I made a couple substitutions and changes though. First, I used beef broth instead of chicken broth. I also did not use caraway seeds. And I added the juice of half of a lemon. The cabbage turned out pretty flavorful but the vinegar flavor was very strong. If I do this again, I’ll probably hold off a bit on the that ingredient. And for the final component, I used this recipe to create a complimentary red wine sauce: Red Wine Reduction. I followed this recipe completely with the one exception being my use of beef broth instead of chicken broth. Overall, I think this is a great recipe but I lost track a bit at the end and I let it reduce a little too far. The flavor was a little too intense as a result, but that is something that is easily fixed. 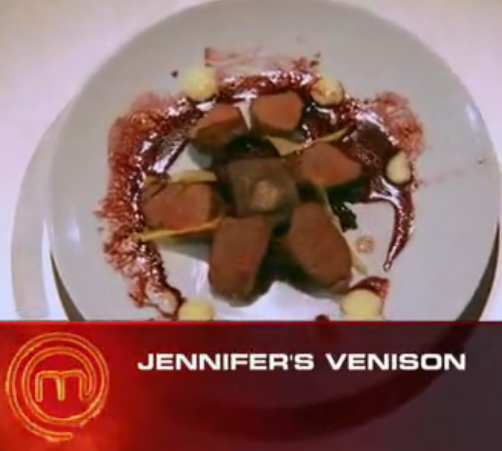 The final dish came together great in terms of plating. 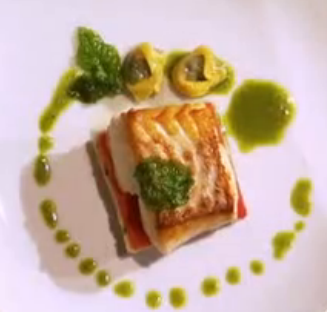 Just as a picture, I was able to recreate Gordon’s dish reasonably well. However, I fell into the same trap as Ben Starr did and overcooked the meat. The other components were decent enough but there were definitely some oddities in the flavors. Since I did not taste the original dish, it is hard to say if I made a reasonable recreation of the dish in that sense, but I definitely did my best at a complicated dish with limited resources. Employment Status: Had a really positive conversation with the hiring manager of a super exciting opportunity that encompasses pretty much everything I’m looking for. I’m really hoping it works out but I’m still keeping my options open. 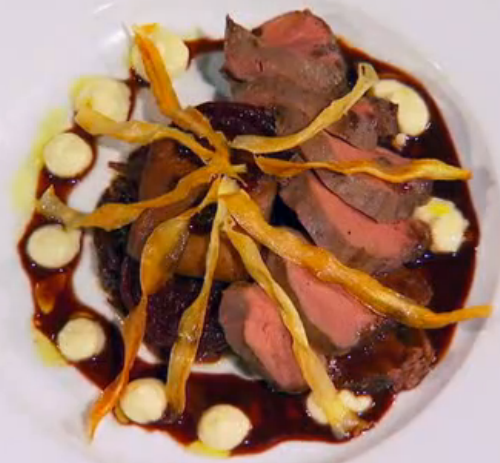 For the last mystery box challenge of the season, the chefs were given several unique ingredients to work with. 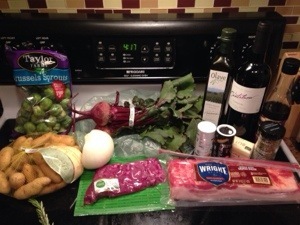 The box contained a rack of venison, bacon, red cabbage, fingerling potatoes, blueberries, quail eggs, beets, hazelnuts, brussel sprouts and red wine. Sheetal (Roasted Venison), Whitney (Venison with Southern Gravy) and Sharone (Pan Seared Venison with Blueberry Puree) were declared the top three with Sheetal having the best dish overall. 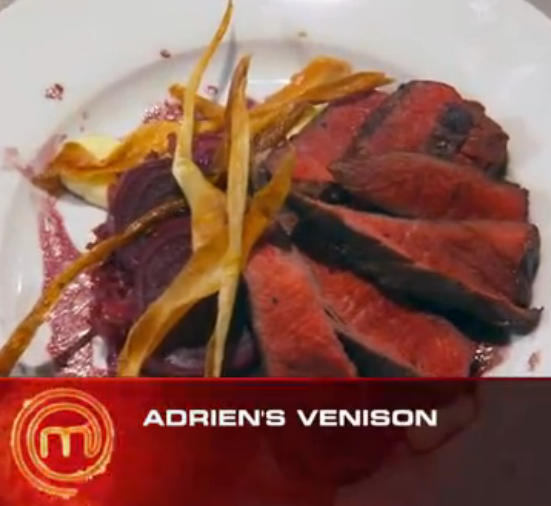 As soon as I saw this challenge, I knew that I would have to come up with a substitute for venison. After some research, I settled on grass-fed, free-range flank steak. 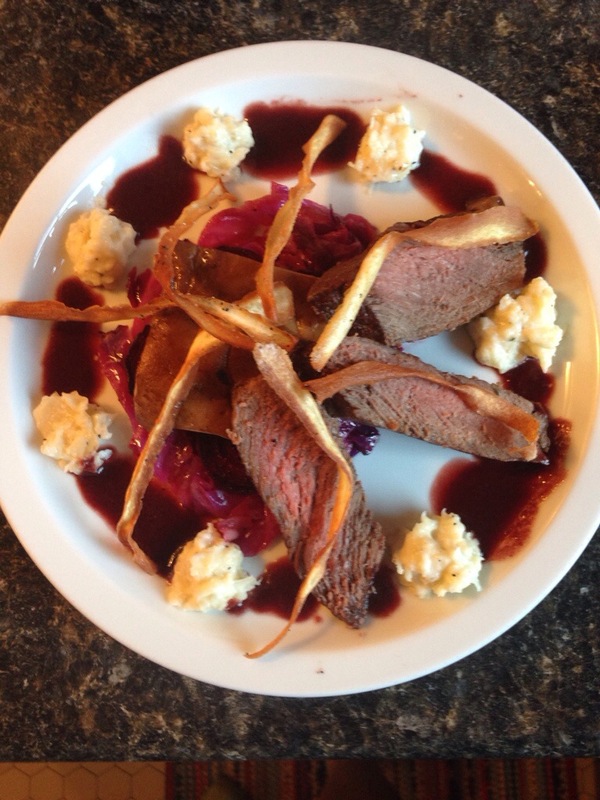 It is clearly not as tricky to cook as venison, but the flavors are similar enough to test out flavor profiles. With this in mind, I decided to do a pan-seared flank steak on a bed of roasted vegetables with a red wine-balsamic reduction. 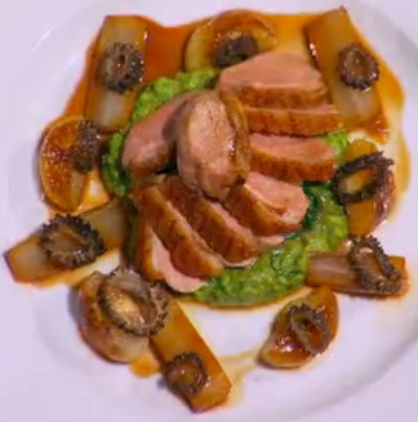 This dish was really simple with most of the work coming in the prep stage. I first seasoned the flank steak with salt and pepper and marinated it in some red wine. Then, I started with the vegetable component. 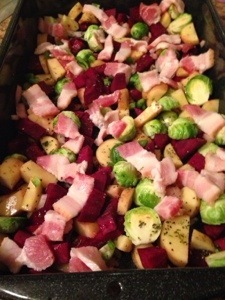 I cleaned and chopped up the potatoes, beets, brussel sprouts, onions, garlic and jalapeño. Then, I tossed this with olive oil, salt, pepper, oregano, basil and thyme, and finally, added some small pieces of bacon. (See below for the compiled dish before it went into the oven). This dish just went into a 425 degree oven until the vegetable were tender (about 30 to 45 minutes depending on how small you chop the vegetables and how well done you prefer your vegetables to be). While the vegetables were roasting, I started the red wine-balsamic reduction. I put about 1/2 of a cup of red wine and 1/2 of a cup of balsamic vinegar in a saucepan with a sprig of rosemary and let it simmer until it was reduced by half. With 10 minutes left on the vegetables, I pan seared the steak in some hot olive oil for just a couple minutes on both sides. 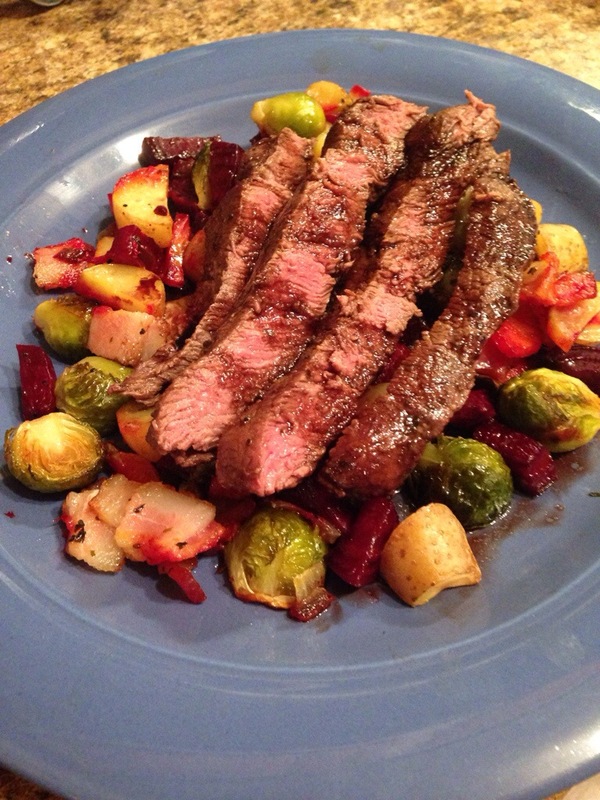 I plated the flank steak on top of the vegetables and drizzled the entire dish with the red wine-balsamic reduction. (See below for the finished product). This dish was delicious! It is definitely one of my favorite things that I have made for this blog. The roasted vegetables were AMAZING and the steak was tender and tasty. 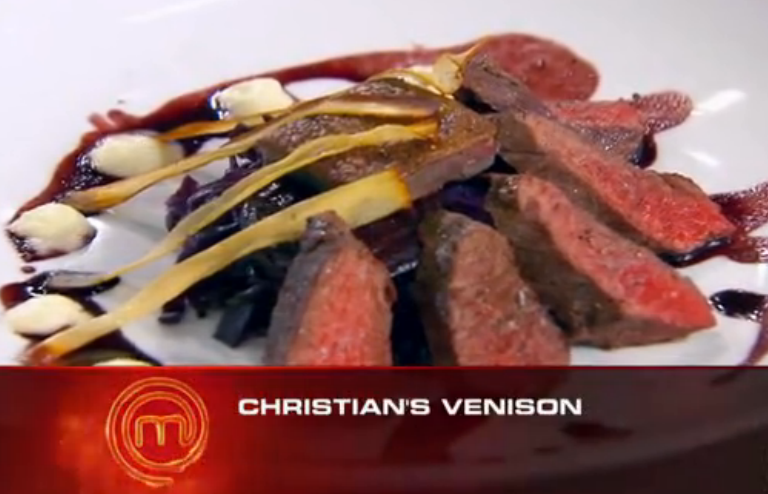 I have no idea how I would have done with the venison, but everything else was so good, I think I could have made an appearance in the top three for this challenge.